The reduction of running tech in both size and cost means ever more people are getting their hands on some seriously smart data-recording devices. While this democratisation of access is definitely a good thing, it also means that increasingly specialist equipment is being marketed as a necessary purchase for even the most average of runners. Long a staple tool for serious athletes, heart-rate monitors (HRM) allow users to keep an eye on exactly what their ticker is up to as they rattle off the miles. But if your ambitions go no further than improving your half marathon PB, why would you consider investing in one? Stuart Hale, a sports coach with Accelerate Performance Centre, describes heart rate as your body’s own rev counter that puts other metrics in the shade. By the time you read this, the spring race season will be well and truly underway and those of you who have trained for a specific event will hopefully have seen the fruits of your labours in PBs and long-held goals achieved. Once you’ve completed a big event it’s understandable to want to take a few days off before running again. But sometimes those days can become weeks, the weeks months, and before you know it you’re no longer on talking terms with your trainers. To stop that from happening, we take a look at the opportunities open to runners who find themselves with all the fitness but not the focus. One obvious path is to take your running abroad. 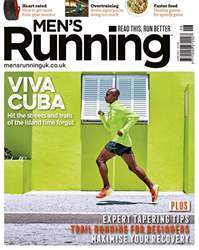 As any seasoned traveller will tell you, the best way to explore a location is by foot and that certainly proved to be the case for our writer, Simon, who decided to combine his passion for running with a life-long ambition to visit Cuba (page 34). If you fancy something closer to home you can utilise the very powerful bit of tech on your wrist to create some new training goals (page 48), or follow our expert advice on how to make the move from tarmac to trail (page 23). Or, if you’re already au fait with off-road, why not take a leaf out of Kilian Jornet’s book and run up Mount Everest (page 54)? For more inspiration on what to do with your current peak condition head over to mensrunning.co.uk and follow us on Twitter and Facebook.